The vast majority of the drugstore make up in my collection is funnily enough, by Collection. I’ve used their products alongside my high end make up for countless years and can remember the days when it first became popular as Collection 2000. The make up I’m wearing today features a lot of Collection products; some I’ve been repurchasing for years, others I’ve been trying out for the last few months. To compliment my foundation (Estee Lauder Double Wear Light- review here, buy here) by concealing my dark circles and imperfections, I used the Collection Lasting Perfection Concealer. I wouldn’t like to hazard a guess as to the number of times I’ve repurchased this concealer because I like it that much. It is very heavy duty and brilliant at concealing imperfections. I use this both under my eyes and on blemishes and set it with a little powder and it lasts all day without sliding off my super oily skin. I generally have two of these on the go at once- one light and one medium for when I’m tanned. 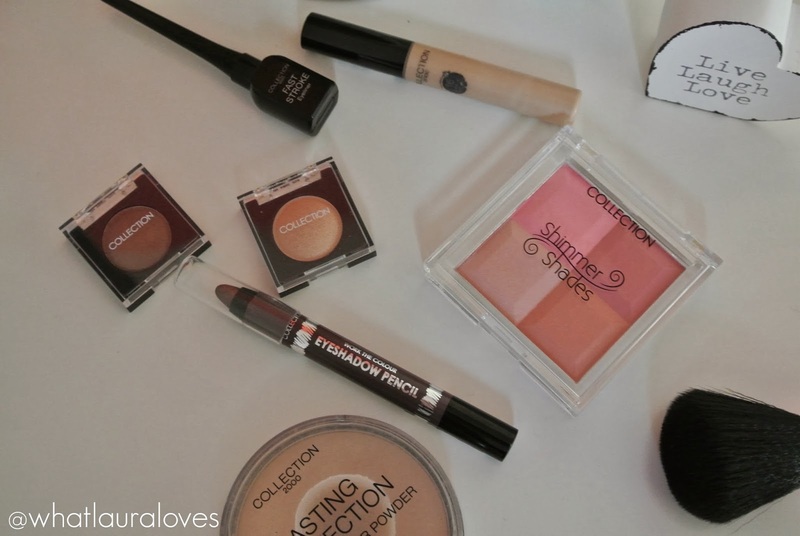 To set my base, I use the Collection Lasting Perfection Pressed Powder. Again, I’ve used this for years and have it in both Light and Medium to use depending on whether or not I’m tanned. This is the best budget brand powder I’ve used for setting my make up and Mattifying my skin and it helps my make up to stay shine free for hours. I have tried the Rimmel Stay Matte Powder which I’ve heard raved about loads but I think that this one is better as it isn’t cakey at all. 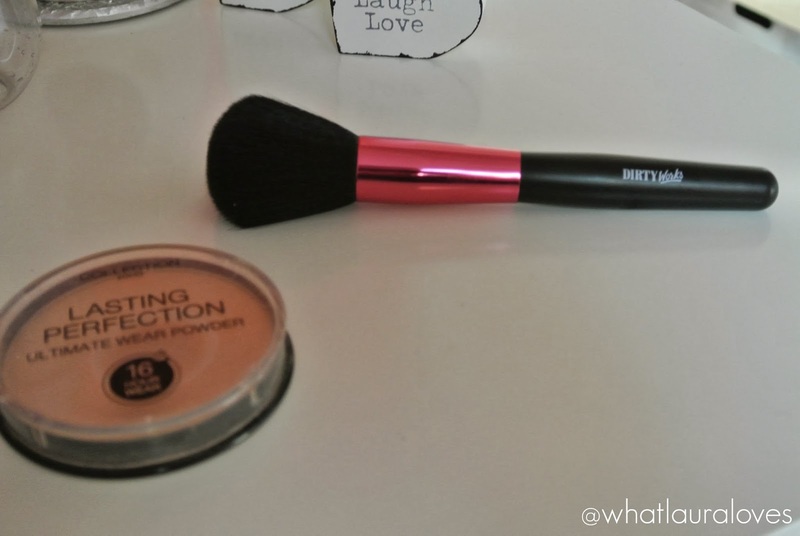 I apply it using the Dirty Works Powder brush which I am super impressed with, especially given the price. It is super soft, picks up and distributes just the right about of product thanks to the dome shaped head of the brush and it’s as cheap as chips. Better still, I’ve actually found a Mini Collection of Dirty Works Brushes on Nelly for £11.95- fab or what! For someone who is a slave to high end brushes, this discovery is great. My purse is happy. The blush that I’m wearing is the Collection Shimmer Shades in Blushalicious which is a blush and highlighting quartet. There’s a light pink, a dark pink, a shimmery pink champagne and a coral orange. 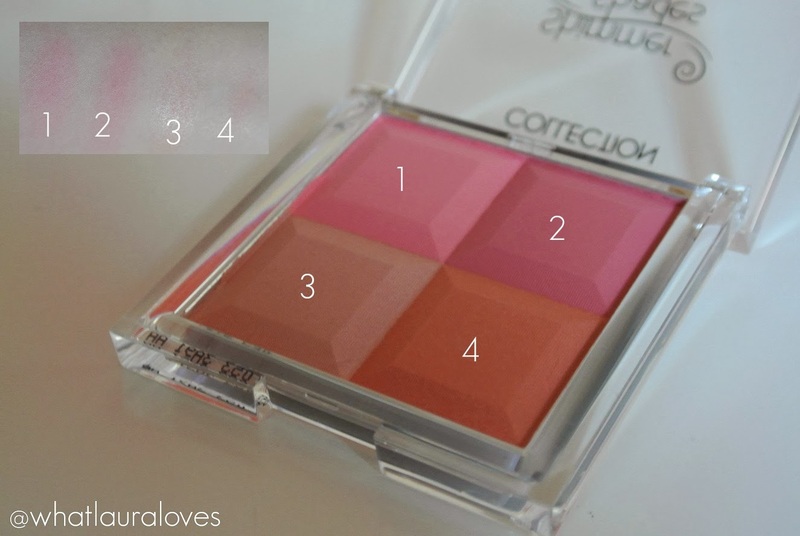 Each of the shades can be used individually or swirled together before application which is how I prefer to wear it. 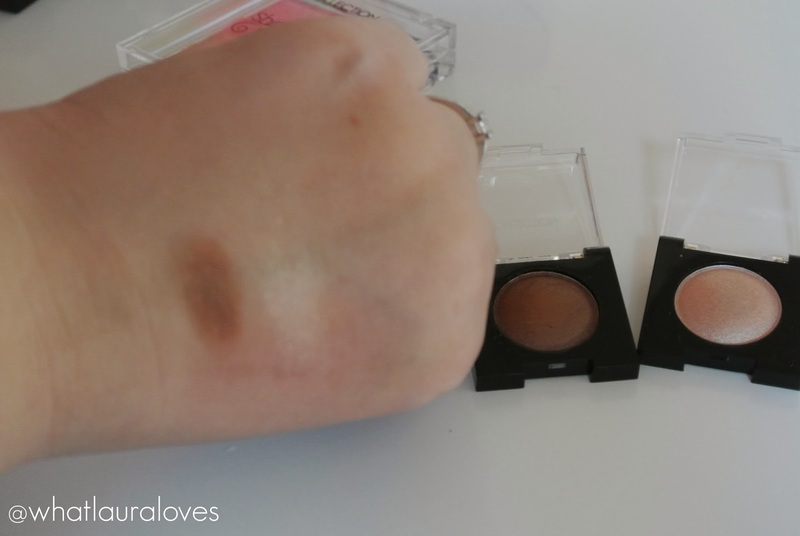 As a blogger, photographing this product was a nightmare because in swatches like this, the blush doesn’t look very pigmented at all but don’t let that fool you into thinking that this isn’t a great blush. When applied to the cheeks using a brush, it is super pigmented and looks amazing. This has quickly become my daily blusher. I LOVE it and when it runs out, I’d repurchase it in a heartbeat. Although I can’t see it running out anytime soon as you get so much product. My eyeshadow look really centres around the eyeshadow pencil that I’ve used. I’m wearing the Collection Eyeshadow Pencil in Hot Chocolate. OMG this is literally AMAZING. It is intensely pigmented, easy to blend and oh so buttery soft. I absolutely adore it. This pencil can be used all over the lid on its own or as a base for powder (gold pigment/glitter looks phenomenal over this) or ran along the lash line for an intense look. The hot chocolate colour is a deep brown with a slight velvet shimmer to it that lends itself well to a cool or warm toned make up look. The great thing about this pencil is that you get the intense colour immediately and then it sets so it doesn’t crease or transfer elsewhere on the eyelid to where you’ve put it. Whether you’re in a rush and want to apply it on its own and blend out or if you want to use it as part of a more complex eye look, you have the option with this pencil and it will look great either way. I highly, highly recommend this pencil. 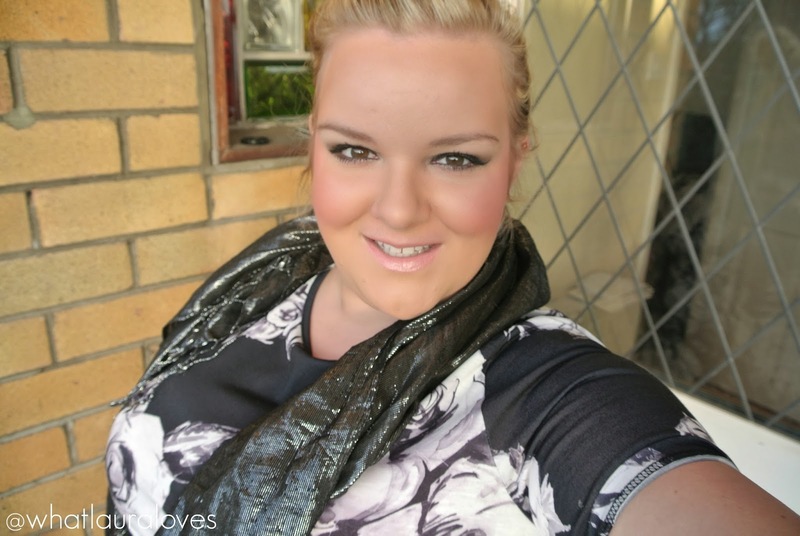 To highlight my eyes, I used the Collection Work The Colour Solo Eyeshadow in Gold Mine. The pigmentation of this eyeshadow is pretty poor and whilst the colour pay off is better than it is in the swatches, it isn’t by much. I find that I really have to scratch the surface of this shadow to get the powder up onto the brush but it is a really buildable formula so I can build it up achieve a nice subtle highlighted look and I love the shade that the eyeshadow is- perfect for a warm candle lit highlight. 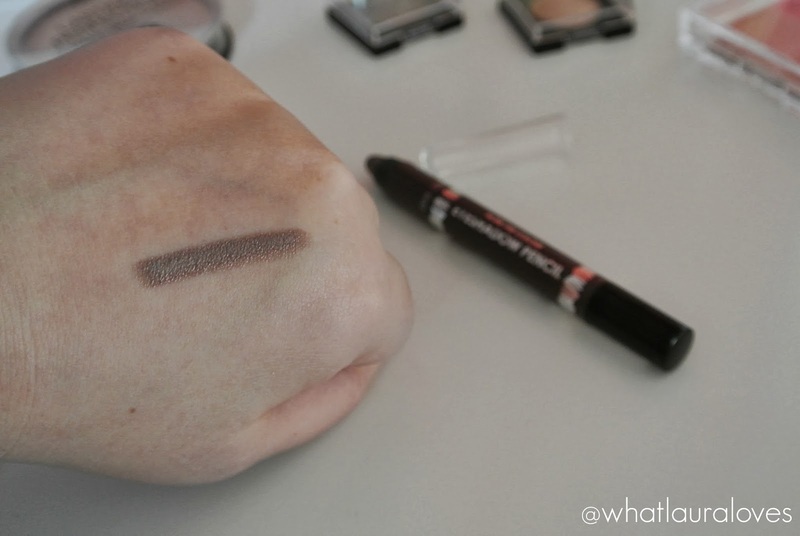 I think it must just be this colour as the other colour I’ve been using, Baked Bronze is perfect, aside from the fact that it doesn’t look too pigmented in swatches, it applies really nicely to the eyelids. The Collection Work The Colour Solo Eyeshadow in Baked Bronze is a beautiful warm brown that I use either all over the lid or blended into the crease like I have in this look. 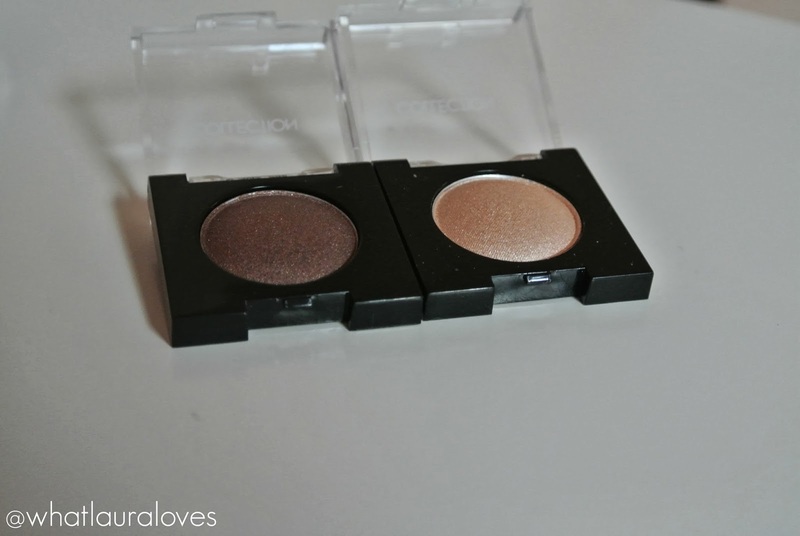 I really like this eyeshadow and have been using it daily with Gold Mine to create a quick and easy smoky eye. The packaging is great too because the shadows are sleek and slender making them light weight and able to fit into even the smallest of make up bags. For eyeliner, I used the Collection Fast Stroke Eyeliner in Black which is very similar to the Barry M Liquid Eyeliner in Black both of which I’m not a fan of. 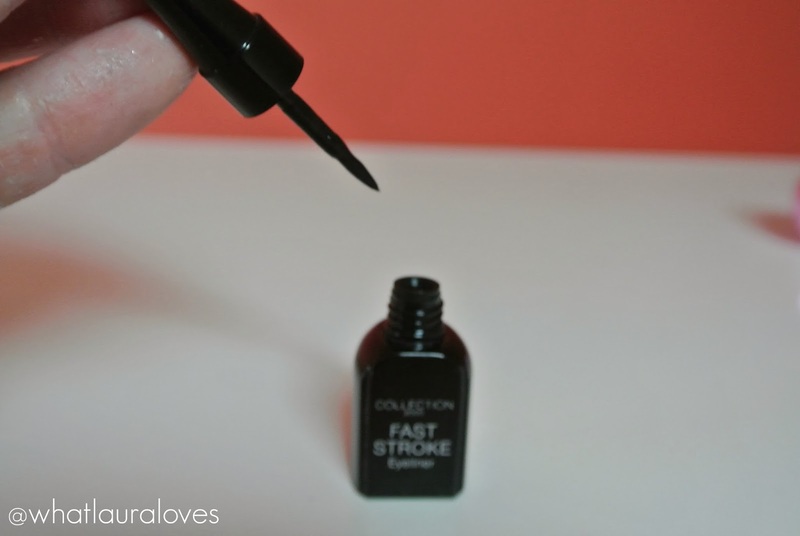 Fast Stroke is a liquid liner that is usually given rave reviews so I would certainly suggest trying it out for yourself and not taking my word for it, it is just unfortunate that it doesn’t work for me. The application isn’t as straightforward as I would usually like as I find that this really drags on my eyes and feels harsh. The liquid liner itself dries incredibly quickly but I found that it irritated my eyes and made them sore and itchy. 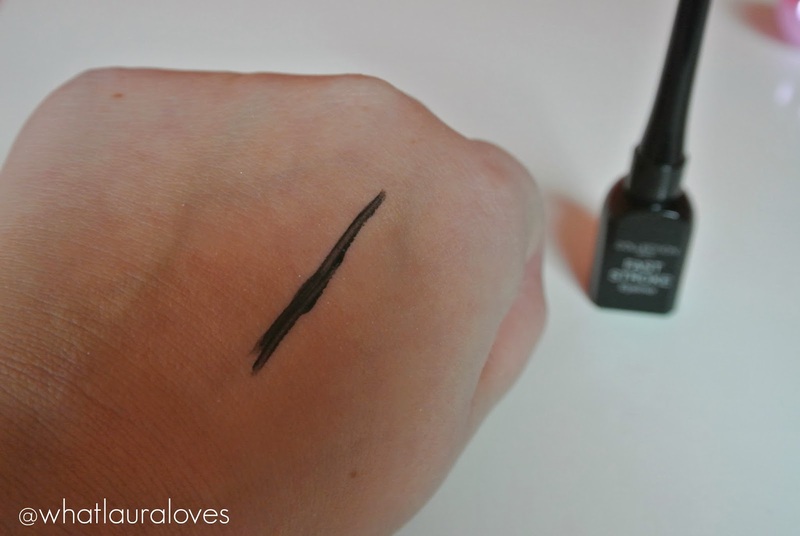 The line has a matte black finish but because the nib of the liner is so hard, it leaves a line in the middle of the line you’ve drawn with product settling either side. 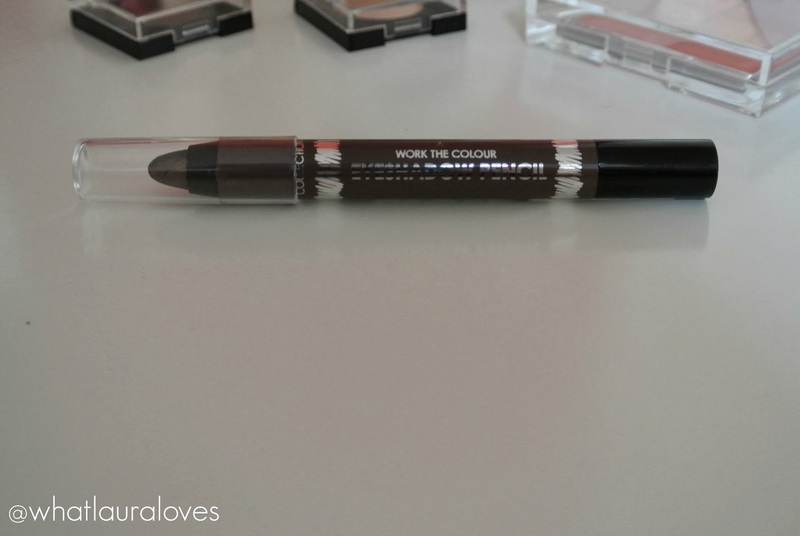 However I certainly wouldn’t suggest moving away from Collection eyeliners as they actually make my favourite liquid liner, the Collection Extreme 24 Hour Felt Tip Liner. This one is so easy to apply, leaves a jet black line and looks amazing. This eyeliner basically taught me how to do a winged cat eye because it was so easy to use that it enabled my hand to move freely and perfect my eyeliner technique. I cannot recommend this eyeliner any more than I have done as I literally tell EVERYONE about it. You can read my full review here (it’s an oldie but I’ve been repurchasing this eyeliner for years- forget the high end offerings, you can stop at this one!). I finished off the look by slicking on some of the Collection Does It All Waterproof Mascara. 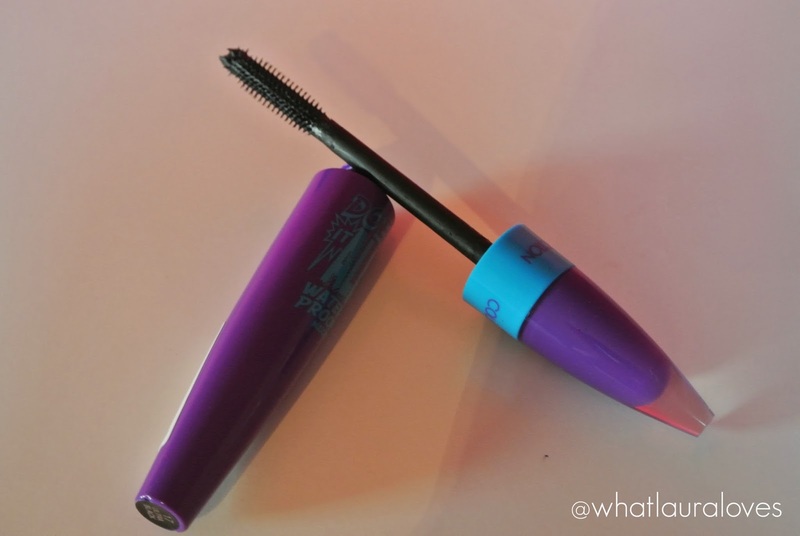 When I first tried out this mascara, I really liked it (full review here) but it seemed to dry up very quickly which I was so disappointed about. Seen as though I liked it so much in the first place I’m now testing another tube out in case there was something wrong with the last one or in case I did something to cause it to dry up. I’m happy to report that so far, so good, the mascara seems to wet and workable and I love the way it makes my lashes look long and volumised. I have super short lashes so this mascara is working well for me at the moment. 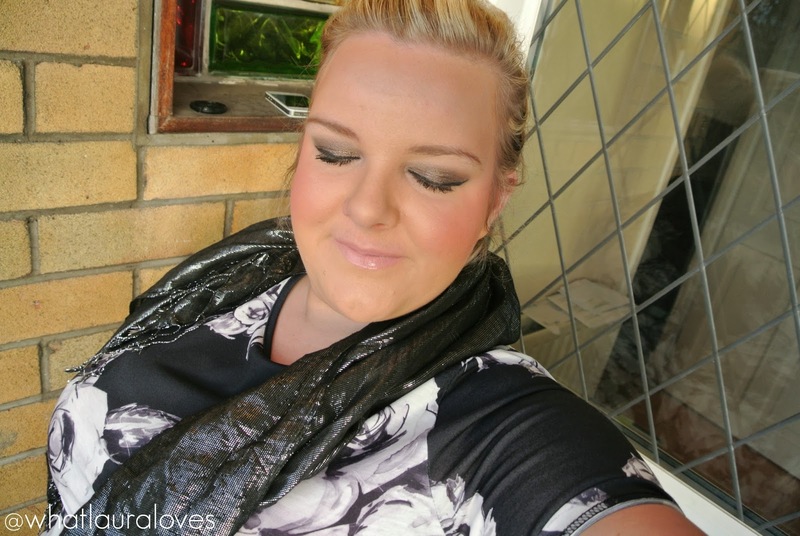 To complete my look, I also contoured using the Sleek Contour Kit in Light, applied 17 Mirror Shine Lipstick in Beehive, lined my eyes using the Sheer Cover Defining Mineral Eyeliner (review here) and pencilled in my eyebrows using the No7 Beautiful Brows Pencil in Blonde. That completes my look. I’ve been wearing this on days out where I need to be a little more dressy that usual and on evenings out with my friends. I love the look these products create and I can’t wait to try more bits from Collection, although at this rate I’m going to have no where to put it… what about the Muji storage I’ve had my eye on…..
What are your favourite Collection products? I am a huge fan of Collection 2000 too, you have some fab bits here, may have to go check them out.